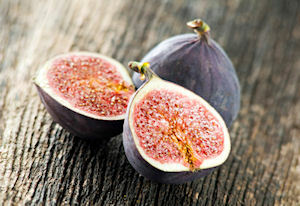 This Mediterranean fig recipe oozes flavour and sunny sophistication. Fresh figs are skewered with rosemary stalks, stuffed with goat's cheese, wrapped with vine leaves and drizzled with honey. Find vine leaves canned or tinned in brine in your local supermarket. If you can't find them, wrap the figs in prosciutto instead. Turn on the grill to medium or prepare a grill pan on the hob. Soften the goat's cheese with a fork. Make a small incision on the bottom of each fig and spoon the goat's cheese into the fig. Season inside and out and continue until you've used all of the figs and cheese. Wrap each fig with a vine leaf and then skewer two figs onto one rosemary skewer. Cook the figs on the grill for around 4 minutes, turning once during cooking. Drizzle with honey before serving. You could easily pipe the softened cheese into the figs if you have a piping bag to hand. The figs should be plump once stuffed and the more cheese, the better. This recipe serves four people as a starter.